I have a special treat for you today. The very talented Shawnda of Confections of a Foodie Bride made a boozy apple breakfast treat! I think she was secretly trying to torture me with this post. I’m a sucker for cinnamon rolls, especially when they’re dripping with icing. 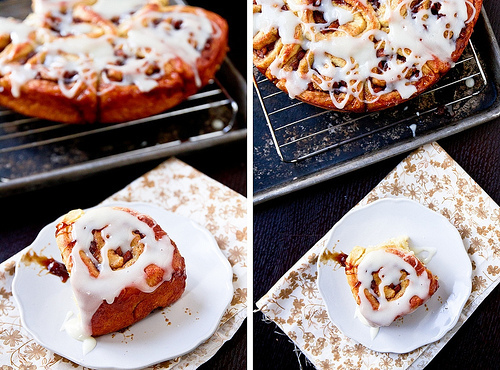 If these pictures don’t leave you craving sweet apple cinnamon rolls, I don’t know what will! 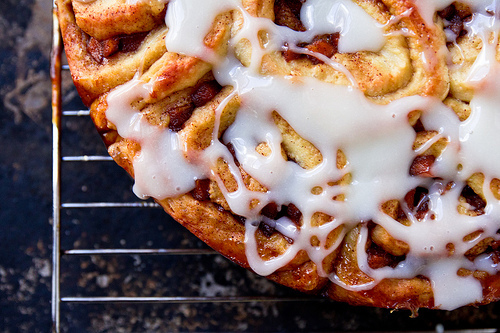 What do you get when cinnamon roll meets apple pie meets a bottle of Jack? All the warm, comforting flavors of fall, enriched with the rich molasses and vanilla notes from the brown sugar and whiskey. In breakfast form. 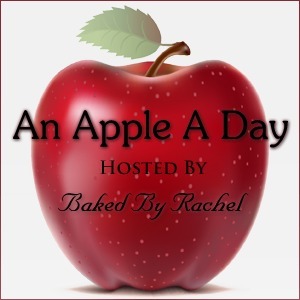 For Baked by Rachel’s An Apple A Day party, I wanted to contribute a breakfast-dessert hybrid that was part comfort food, part dessert, and borderline irresponsible. Nailed it. Although it might be slightly more than just “borderline” irresponsible. The apple-cinnamon combination is a solid classic so I dressed up our favorite overnight cinnamon roll dough with pretty flecks of vanilla bean, stuffed the dough with a brown sugar-cinnamon-Jack Daniels-apple mixture, and then topped with a Jack Daniels cream cheese icing. It’s part breakfast, part dessert, and completely magical. Make the dough: In the bowl of a stand mixer fitted with the dough hook, beat the egg yolks, whole egg, sugar, butter, vanilla, buttermilk and half the flour together until well combined. Add yeast, salt, and the next 1 1/4 cup flour (leaving about 3/4 cup remaining) and knead on low for 5 minutes. Add additional flour by the spoonful if necessary - you want the dough soft and moist but not overly sticky. Knead another 5 minutes until the dough clears the sides of the bowl (but might still stick to the bottom a bit). Transfer dough to a lightly greased, large bowl and let double, 2-2.5 hours. Just before the dough is finished, make the filling. Melt the butter in a large saute pan and add the diced apple. Crumble 1/2 cup of brown sugar over top and stir in the cinnamon, a pinch of salt, and Jack Daniels. Simmer for 10 minutes, until thick and bubbly. Remove from heat, stir in vanilla, and set aside to cool. Spray or butter a 9-inch pan. Turn out the dough onto your lightly floured work surface. Stretch and roll the dough into a ~12x18 rectangle with the long edge nearest to you. Sprinkle the remaining 1/2 cup brown sugar over the dough, leaving the top 1-inch bare. Spread the cooled apple mixture over the dough. Starting with the edge of the dough closest to you, roll the dough into a cylinder and pinch the the seam to seal. Gently press, squeeze, and stretch the roll to get an even thickness. Cut the roll into 1 1/2-inch slices and place in the baking dish (you'll get 12 rolls). Cover tightly with foil or plastic wrap and refrigerate overnight. Place the rolls in the oven with the heat off. Fill a shallow pan 2/3 full of boiling water and place it on the rack below the rolls. Close the oven and let the rolls rise for ~30 minutes. Remove the water pan and rolls from the oven and preheat the oven to 350. Bake rolls on the middle rack for 25-30 minutes, until golden brown. While the rolls are cooling, beat the cream cheese, milk, Jack Daniels (to taste, 1-2 tsp at a time), and powdered sugar together until smooth. Drizzle over the rolls and serve. Leftovers can be stored in the fridge, tightly covered. Rewarm in the microwave for best results. You can find Shawnda on Facebook, Twitter and Pinterest. Check out some more of Shawnda’s amazing recipes: Meatball sub pizza, Braided pesto bread and Frito pie burger.